* Full training plus board care at Karver's Creek. Check out facilities and care philosophy on the "farm" page. * Partial training plus board care at Karver's Creek. * Coaching for haul-in guests. * Working student position is available at times. Please call and inquire. We can work together to figure out what is best for you. Join me on the equestrian learning journey. I would love to work with you and your horse. It is not necessary to be interested in showing to be welcome at Karver's Creek. 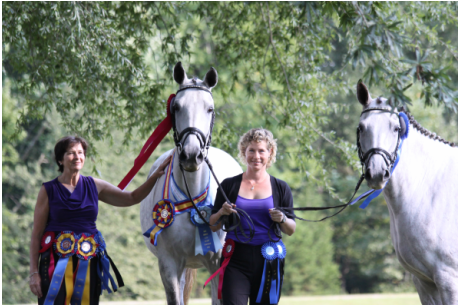 All horses are conditioned and cared for as equine athletes. Happiness and joy are top priorities. However, Jeanne and many students have earned great success at competitions, enjoy the show environment, and welcome new friends. Raised on a farm that boarded horses and harvested hay in Indiana, dressage education was always my primary interest. However, dressage was not yet popular in the midwest. We also jumped, showed western games, drove pony carts and rode in parades. I was surrounded by many breeds and personalities of horses. After graduating from Purdue University, I finally enjoyed the advantage of mobility. I worked at professional barns in several locations throughout the U.S. and learned from many wise and generous people. I decidedly focused on dressage while gaining more skills in ground training and management of the equine athlete. Even though I still cross train all the horses in my charge, I focus my performance exclusively in dressage and enjoy reaching for lofty goals in competition. My personal horse, Wonder, is schooling the Grand Prix currently and we aim for a debut in 2019. I raised and trained Wonder her entire life. I love the privilege of showing other owner's horses too. I am happy to train from the earliest level to the highest ability of the horse. I love trails, cavaletti, small jumps, performance tricks, breed shows, ground manners, trailer training, grid work and most of all, riding dressage!